The Old Hall Hotel, Health & Spa01493 720400work HotelThe Hotel can be found in the heart of the lifeboat village of Caister-on-Sea within a 10 minute walk from the beach and only 2 miles from the popular seaside town of Great Yarmouth. Here we are dedicated to making our guests feel welcome and at home in a relaxed atmosphere. Our spcaious hotel rooms are fully equipped for today's discerning traveller. All are en-suite and most are air conditioned. The Hotel rooms provide clean, comfortable and welcoming accommodation with twin, double and family (triple or quad) rooms available. 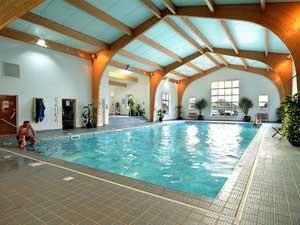 Part of our leisure facilities, our 17 metre swimming pool is available to hotel guests. Our pool is maintained at a temperature just warm enough to relax in but cool enough for those wishing to swim the lanes. After a dip in the pool take advantage of our Nordic sauna and steam rooms, designed to help you de-stress and unwind in both dry and humid heat respectively. These traditional heat therapies are just the thing to relax the body, detox the skin and revitalise the mind. The bubbling hydrotherapy pool is the perfect place to prepare for your spa treatments (available at extra cost) or to continue your relaxation afterwards. Our beautifully apoointed treatment rooms are a haven of peace and tranquility. Our air-conditioned gymnasium features state of the art TechnoGym equipment and our staff aree professionally trained to help you. Please note children under 16 must be accompanied by an adult at all times and may only use our leisure facilities between 10am and 6pm. The Hotel can be found in the heart of the lifeboat village of Caister-on-Sea within a 10 minute walk from the beach and only 2 miles from the popular seaside town of Great Yarmouth. The attached independently ran Bradford's Restaurant is opened daily for a delicious and varied menu complimented by a selection of fine wines, real ales and draught beers. On arrival in Great Yarmouth follow the signs for the A149 Caister-on-Sea, proceeding over the mini-roundabout by Yarmouth Stadium and through the village until you reach the traffic lights. Turn left at the traffic lights into the Old Hall car park.